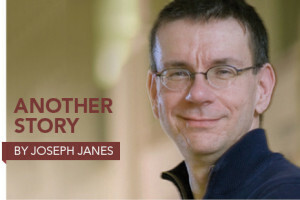 More than five years after the start of the Great Recession, school libraries in the US are in crisis, their budgets constricted and their staff short-handed or nonexistent. Professional staff positions are left vacant or filled by uncertified personnel, materials budgets slashed. Many library programs have been eliminated. Most of these actions are taken at the administrative level, outside the control of both library supervisors and building-level school librarians. Often, the only person who can speak out against such actions at the district level is the library supervisor. Yet just as other government managers are trying to cope during a weak recovery, these district supervisors are expected to do a lot more with a lot less and are forced to pick up most of the slack themselves. 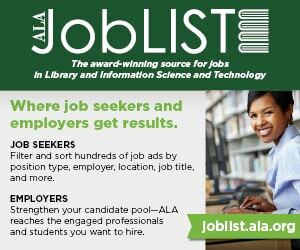 So says a new study, the first national survey of district school library supervisors conducted in more than half a century. The Lilead Project survey (rhymes with “Iliad”), involved questionnaires sent to supervisors nationwide in districts with 25,000 or more students. It was funded by the Institute of Museum and Library Services (IMLS) and conducted during autumn 2012 by a research team at the University of Maryland’s College of Information Studies. The survey had a very high response rate—61%—among the 290 districts that participated and included the largest districts in the country and in each state. The responding districts represent 38 states. The survey will be repeated this autumn with the same kinds of school districts. The last similar survey was conducted in 1960. The fact that district school library supervisors have markedly fewer resources, on average, is clear. A higher percentage report cuts rather than increases in essential funding such as district funding and building funds, while technology funding is barely staying even: 40% of respondents had cuts in district funding versus 6% who had increases, and 42% saw cuts in their building funds versus 4% who had increases. Technology funding, meanwhile, was a wash in 2012: 22% had cuts, 21% had increases, and the rest saw no change. Staffing was under siege as well: 42% reported a drop in building-level staffing, 33% saw a drop in district-level staffing, and 34% had a smaller candidate pool, as opposed to 8%, 5%, and 16%, respectively, who saw increases. Moreover, more schools now have unqualified staff or volunteers running their libraries because many certified librarians are gone. “More media specialists are being hired who have not been university trained. They are teachers who took only the test, and many don’t have a clue as to what being a media specialist is all about,” said one. “We have many school libraries operating with media clerks only,” said another. “Budget cuts over the past few years have taken away all my staff, except for my secretary,” said a third. Changes in education at the national level have also forced changes at the district and school level, including the library supervisor position. Not all of these changes are positive. 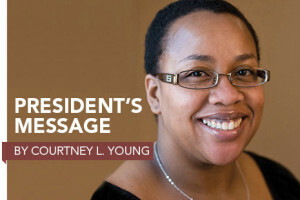 “Over the years, my ability to communicate directly with building principals in their monthly meetings has been hampered due to new state and federal initiatives, i.e. No Child Left Behind and Common Core, and there is not time for me to present as I used to; this causes [the school principals] to sometimes forget about library programming, ” said one library supervisor. Nor are principals the only ones who forget why schools need libraries, according to the survey. “Our state does not require schools to have a librarian or media specialist, certified or not certified. In many cases, a paraprofessional or parent volunteer is in most schools to just check out and shelve books,” one respondent commented. Said another, “Administrators need to be informed of the importance of using professional librarians to the fullest. Many administrators, principals, and teachers are not well informed of what the role of the librarian is.” This is despite evidence that properly staffed, well-stocked school libraries can overcome even low socioeconomic status to help improve children’s school performance (“The Void in Charter Schools,” American Libraries, June 2013, p.26–30). Bottom line: If school districts want student performance to improve, having full-time certified library media specialists and properly stocked and funded school libraries is just as important as having certified teachers. District-level library supervisors usually do a variety of tasks to support building-level librarians. While respondents reported having responsibilities in numerous and diverse subject areas and departments, there were commonalities: All had some responsibility for professional development of building-level personnel, with 93% fully responsible for this task. More than 80% had some responsibility for providing technology support and tech training to school librarians, with 50% having full responsibility. 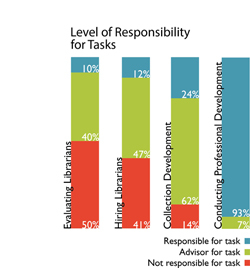 In addition, more than 85% of supervisors responding had some responsibility for collection development, but only 62% advised their school librarians on collections. Survey respondents reported an increasing emphasis on content standards and students’ information literacy skills. 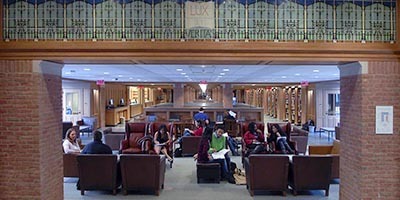 They also reported spending more time communicating the library’s role in improving student achievement and encouraging school-level librarians to collaborate more with classroom teachers. That’s a challenge when so many librarian positions have been traded for library clerks or eliminated altogether. Still, respondents saw leadership as their most important responsibility; 83% rated their leadership responsibilities as extremely important or important. Advocating for library programs and developing a vision and mission for the district’s program were the most important aspects of leadership. Other tasks rated high in importance were handling book challenges and censorship issues and managing library automation systems. Sometimes the school librarians (or their substitutes) aren’t to blame: “At the building level, due to implementation of [district policies] and a decrease in funding, library personnel (including librarians and clerks) are being pulled from their regular assignments, and that decreases the amount of time for them to spend on library duties,” including professional development, said one respondent. The survey revealed that whereas 95% of the library supervisors are full-time employees of the district, only 56% of supervisors surveyed spend all their time on district library services. Respondents with more than one district-level responsibility spent an average of 41% of their time on library services. A small group (8%) are also building-level librarians. “I am a building-level teacher-librarian who is [also] the senior librarian in the district and has a role of mentor and technology guide for the other teacher-librarians in the district. My ‘real’ job is to teach research, promote reading, and manage the school library for a campus of more than 2,500 students,” wrote one such respondent. Her school district has more than 25,000 students. That’s large enough that using the recommended rule of thumb for how many librarians she should have in the district (one full-time state-certified library media specialist plus one aide, clerk, or library technician for every 750 students), she should be supervising a minimum of 32 or 33 school librarians full time—the equivalent of an entire classroom of librarians. But she doubles as a school librarian in addition to being a district-level supervisor. In some cases, hard-pressed districts are relying on the good will of library supervisors to continue on a volunteer basis. “I am semi-retired, and only work part time. The district could not afford to replace me with a full-time position when I retired, so I am doing this to try to hold things together for the time being. It’s simply not enough,” one respondent said. “As a result of the extremely limited time, and no support staff, I am limited in what I can accomplish,” said another. Many respondents were crying out for support—not only from their own districts in terms of resources or from legislators when it came down to budgets, but also from their own peers. “I need help planning professional development for my school-based media specialists. I’m the only [person] planning their professional development, and it would be nice to have others to help me plan,” one said. “I need more professional development with my peers so that we can share our experiences and learn from one another. At the regional level, there are no librarians leading the professional development sessions; it has been relegated to English language arts curriculum,” said another. In general, respondents said they need more training in leadership, teaching and learning, supporting state standards such as Common Core, managing personnel, and financial responsibilities. They said they also wanted additional instruction on specific topics in technology and technology integration, such as implementing ebooks and e-readers into collections, new service models such as BYOD (bring your own device) and one-to-one technology programs, and long-range planning for digital content and tools. 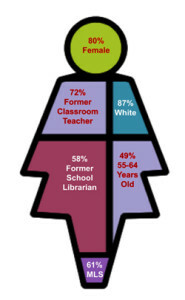 The typical district library supervisor is female, white, a former classroom teacher, and a former school librarian with an MLS degree. About half are between the ages of 55 and 64, the survey found. However, figuring out who the library supervisor is in a given district can be a real challenge because of the multiplicity of titles under which the position exists. According to the data, districts use 11 different titles for the supervisor position (see word cloud figure). The top three titles are library coordinator, director, and supervisor. Though the name for most district library offices is a variant of “library services,” survey data reveals more than 20 different department names used. Some districts split responsibility for library programs among multiple departments. More than 90% of respondents are located somewhere within the departments of Curriculum and Instruction (71%) or Educational/Instructional Technology (22%). The size of district library services offices varies considerably. Almost half of the district offices (48%) have no professional full-time staff other than the supervisor; in contrast, 9% have six or more full-time additional professionals. To the extent that a district office does have staff for the library supervisor, there appears to be a preference for full-time rather than part-time positions: only 14% reported having part-time professional staff. However, district offices are more likely to have clerical or support staff rather than additional professional staff, again with a preference for full-time positions. Whereas 28% reported no clerical or support staff, 19% had six or more full-time clerical or support staff members. One clear message from this first Lilead survey is that district supervisors feel isolated and would welcome opportunities for professional development and peer support. In response to this, the Lilead Project has developed two initiatives. The first is the Lilead Network, an online community open to any individual responsible for library programs and services at the district level (lilead.umd.edu). 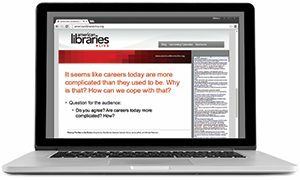 This network allows supervisors to discuss current issues, present ideas, pose questions to peers for comment, and support fellow library supervisors. The second is the creation of the Lilead Fellows Program, also funded by IMLS. The Fellows Program is an intensive 18-month professional development program in which 25 supervisors chosen from all over the country will work together on current issues in their school districts. They will brainstorm and implement new strategies on issues dealing with 21st-century skills implementation, technology integration, and advocacy. Fellows will work in small groups, both in person at conferences and virtually between conferences from January 2015 to June 2016. The program will begin at the 2015 ALA Midwinter Meeting and Exhibits in Chicago. This article was written with the support of the entire Lilead Project team: Ann Carlson Weeks, principal investigator; Jeffrey DiScala, co-principal investigator; Diane L. Barlow; Sheri A. Massey; Christie Kodama; Alexandra Moses; Kelsey Jarrell; and Rebecca Follman. Additional assistance was provided by freelance editor Maria R. Traska. To learn more about the Lilead Project, please visit lileadproject.org. MARIA R. TRASKA is a Chicago-based freelance writer, author, and blogger.